ONE REPLACES FOR FOUR ADAPTERS. There are four output ports (HDMI, VGA, DP, and DVII) that you can carry it everywhere you went. 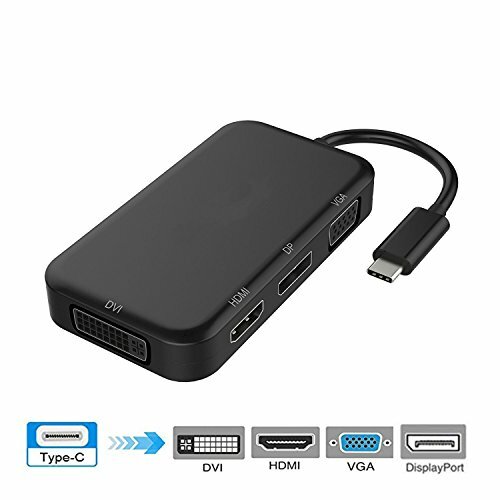 The 4-in-1 adapter for connecting a USB-C/Thunderbolt 3 port compatible computer to an HDTV, monitor, or projector with VGA/HDMI/DVI/DisplayPort; A separate VGA/HDMI/DVI/DP cable is required (sold separately). 3.Only one display (HDMI, DVI, VGA or DP) can be connected at a time. Requires an HDMI/VGA/DP/DVI cable (Sold Separately) for connection to a display. 4.The 4K resolution requires a 4K equipped source, HDMI/DP/DVI cable, and output display. 5.It does not support USB-C with MHL solution or SlimPort solution, not of DP Alt mode. 2.4 in 1 Type C Multiport Adapter：4 in 1 USB3.1 (Type-C) to VGA /DVI/HDMI/Display Port (DP) Adapter Converter Cable. 1 display output connection at a time. 4.No Driver Installation: USB-C port multiport adapter offer a plug-and-play solution without more time for driver installation.